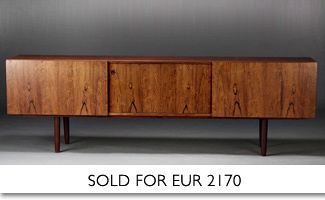 Each day more than 12,000 auctions are being held at Lauritz.com – and they are being seen by more than 140,000 visitors. So have your items valued now and sell them at Lauritz.com. Is valuation from a photo possible? Yes, you can send your pictures via e-mail or by mail to the Lauritz.com auction house closest to you. You will then be contacted by a valuation expert. You are, of course, more than welcome to come visit us at one of our Lauritz.com auction houses and get an appraisal on the spot. When will I receive a response to my enquiry? We always do our best to reply to all enquiries as quickly as we can. As far as possible within 2-3 days. As a seller what do I have to pay in commission? For every lot sold a seller's commission of 15% of the highest bid is calculated, as well as a seller’s hammer fee of DKK/SEK 150, EUR 20. Commission and hammer fee include VAT and cover all costs relating to the sale, including registration, taking photos, online display and storage during the auction period. Commission and hammer fee are deducted from the payment due to the seller. When are my items put on auction? Most lots are put on auction just 2-3 days after they have been consigned. An auction lasts normally 5 days.